Psychologist (U.C.L – Belgium), therapist, meditator, dancer, gardener and writer, living and dying, working and celebrating at the OSHO International Meditation Resort – Pune – India since 40 years (including the 70´s Ashram in Pune, India, the 80´s International Commune in U.S.A. and the present OSHO International Meditation Resort in Pune India). Her passion is her work which is a divine play that includes Woman and Dolphins, Men and “The New Dawn”, Clarity and Light and most of all the Healing Power of Love and Joy. Ambu has created: Tao of Love Therapy, Healing and Meditation Journeys, Tantra – Zen Retreats, Zen- Latino Events, Beyond Karma Retreat, Tao Therapy sessions and courses and a School of Goddesses called “Celebrating the New Woman Beyond the Goddess”, with a Woman’s Mystic Circle worldwide to support women’s empowerment according to Osho´s Vision of a New Woman, a New Man, and a New Humanity. She has been trained in various healing and therapy methods at the OSHO Multiversity in Pune India, first at the Mystery School for 5 years in: Energy Work, Chakra Healing, Aura Soma Therapy, Energy Reading, Past Life Therapy, Primal, Woman’s Liberation Work and Neo – Tantra. And then since many years at the present OSHO Multiversity in: Family Constellation, Transomatic Dialogue for Self Healing Therapy, and Osho’s innovative Meditative Therapies. Recently she participated in the summer retreat of the well known Qigong master Mantak Chia, at “Tao Garden” in Chiang Mai, Thailand, where she learned Tao Healing practices for Health and Well Being and also the Tao Alchemy to transform our vital energy into Love & Light. just in the simple natural flow of energy. 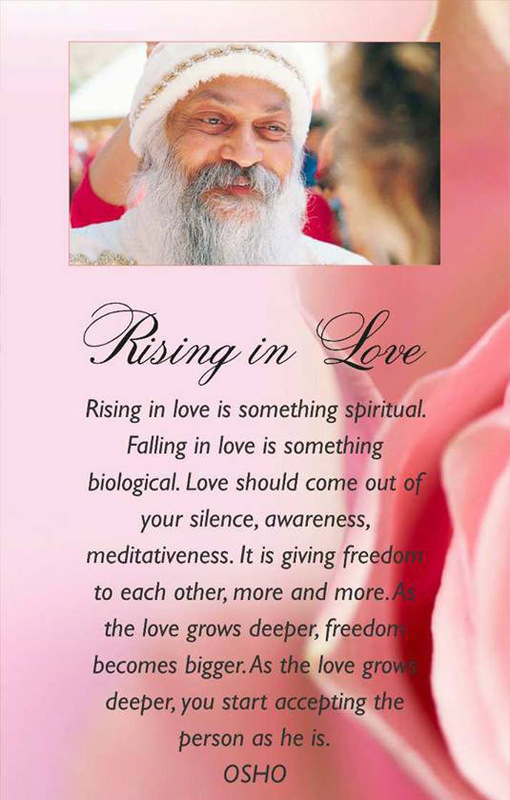 She has received the OSHO® Institute for Woman’s Liberation, which offers courses and training’s for women at the OSHO Multiversity in Pune India and around the world in various locations like Bali, Thailand, Spain and Greece. She is writing a fable about her experiences as a living witness of the Beyond Death Celebrations of some of her fellow travelers and is also writing a book about the Goddess: Celebrating the New Woman/Beyond the Goddess. Ambu works and participates in the field of Spiritual Therapy that combines the ancient wisdom of the east and the science of the west to create a stage for individual and global transformation according to Osho’s Vision. She has been trained in the USA in Past-Life Therapy by the well-known author Dr. Brian Weiss and has created a unique process based on her experiences as a meditator which includes Osho’s understanding about reliving past lives and is inspired in the loving teachings of Brian Weiss. For many years now she has been traveling extensively all around the world and lately mainly to China, Bali and Europe, sharing the jewels she has gathered along the way, learning while sharing with gratitude and joy.